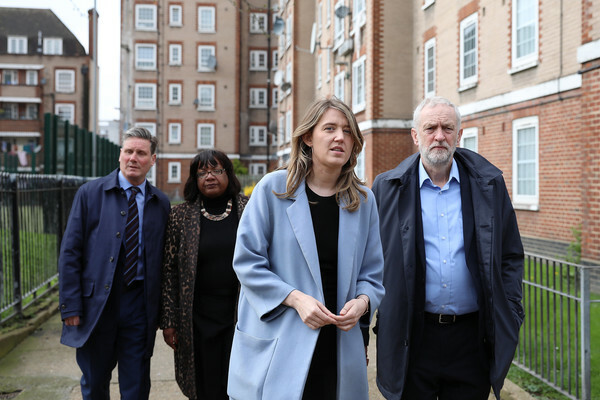 (R-L) Labour leader Jeremy Corbyn, Leader of Camden Borough Council Georgia Gould, Shadow Home Secretary Diane Abbott and Shadow Brexit Secretary Sir Keir Starmer walk through the Peckwater Estate on April 10, 2018 in London, England. 35 people have been fatally stabbed in the UK capital since the beginning of 2018 with knife crimes across the country rising 21 per cents in the 12 months to September 2017 and stabbings in London at their highest level for six years. The Peckwater estate in Kentish Town was the scene of the murder of Abdikarim Hassan who was stabbed to death near his home on 20th February, five other young people were stabbed across London in the same night.